The best and worst IPOs of the year for share-price performance to date were Shake Shack Inc. (NYSE: SHAK) and Etsy Inc. (Nasdaq: ETSY). SHAK is the best-performing new stock of 2015 to date and has gained 66.9% since its Jan. 30 debut. Meanwhile, ETSY is the worst-performing IPO of the year, having fallen 46.7% in the two months it's been on the market. That's among a less impressive group of new stocks than we had last year. This year's IPO calendar so far has been lackluster compared to last year's record-breaking performance. There were 273 IPOs in 2014. Last year's IPO market was the most active since 406 companies went public in 2000 at the height of the dot-com bubble. It was also the second year in a row in which there was at least one IPO each week. But 2015 has been dramatically slower as companies remain wary of volatile currency markets and global interest rate movements. The first quarter of 2015 saw 34 IPOs raise $5.4 billion. According to Renaissance Capital, a manager of IPO-focused ETFs, that makes it the least active quarter by IPO count since Q1 2013. It was the smallest by funds raised since Q3 2011. The best and worst IPOs of Q1 2015 were Shake Shack Inc. (NYSE: SHAK) and Zosano Pharma Corp. (Nasdaq: ZSAN), respectively. ZSAN stock is down 30.1% since hitting the market on Jan. 26. Healthcare companies made up 47% of all IPOs in the first quarter, with 16 deals. That total was still lower than in any quarter last year. The decline wasn't limited to health care. It occurred across every sector, particularly energy and technology. The energy sector saw only two companies go public. There were only four tech IPOs in Q1 – down from 14 during the year-ago quarter. 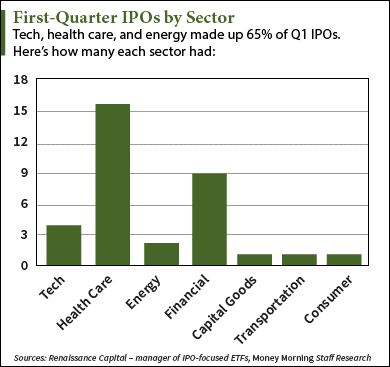 However, the lagging energy and tech sectors provided the two largest IPOs of the quarter. Natural gas company Columbia Pipeline Partners LP (NYSE: CPPL) raised $1.1 billion in its February debut. Cloud analytics firm Inovalon Holdings Inc. (Nasdaq: INOV) raised $600 million and is up 11.9% from its IPO price. Only 10 of the 37 companies that hit the market last quarter were profitable. That's a 43% decrease from the first quarter of 2013. GoDaddy Inc. (NYSE: GDDY) was the fourth largest IPO of the first quarter despite not having turned a profit in its 18-year history. Companies holding IPOs have lower revenue growth too. According to Fortune, most companies that went public in 2013 boasted sales growth of 50% over the previous year. This year, it's about half of that. "The IPO used to be a moment of glory," Fortune reported. "Now it's a sign of desperation."